As we approach the Mayoral election tomorrow in London, and the end of Boris Johnson's eight years in office, so the builders race to finish his principal legacy to London before he finally vacates the chair. Not the bus that gets too hot, not the cable car that only has one regular passenger, not the quite pointless two-way conversion of a few streets around Piccadilly that were one-way, not, for God's sake, the preposterous, as yet unbuilt, Garden Bridge. No, his principal legacy is the four segregated Cycle Superhighways, and principally the East-West Superhighway (which it would appear now will be eventually designated CS3, continuous with the existing CS 3 to Beckton), and the North-South superhighway, which has been designated CS 6. These meet at the crossroads of Blackfriars Bridge north side. The system is not yet fully open, but it seems likely to be so within weeks or even days. This blog started with articles covering the cycle protests at Blackfriars towards the end of Johnson's first term in office, at which stage he had done little for cycling except paint meaningless and dangerous blue 'Superhighway' markings on some roads. The protests were against this lack of progress, the danger at major London junctions controlled by the mayor for cyclists (and pedestrians), the cycle deaths that had occurred at Blackfriars and elsewhere on account of poor or non-existent cycle infrastructure and terrible, antiquated motor-centric road designs, and against a scheduled rebuild of the Blackfriars junction that promised to make it no better for cyclists and pedestrians. Blackfriars was where all this started. It appeared to me that Boris made no concessions to the campaigns of the last year at all. He did not admit that his Cycle Superhighways have been very poor and have not lived up to the initial promises he made for them. He did not agree that cycling casualties per mile are increasing. He several times referred to people who want a cycling infrastructure "ideal world" which is unachievable, implying that talk of giving cyclists proper, protected space on London's main roads, in other words, Going Dutch, is not really possible. Towards the end of the meeting he seemed to be implying that the cyclists in the room were all greeny unrealistic lefties, wanting to see the back of all motor traffic in London, saying, in a bizarre improvisation on words, that it was not possible to "Pasturise [or should that be Pasteurise] London". Well, what we didn't know at that moment was that Boris had already agreed, by the time that meeting started, to sign the LCC's Love, London, Go Dutch pledge to build proper cycle infrastructure in London. The die was cast. Cycle lobbying had become a significant political force in London, which he had to realistically acknowledge. This may have been a cynical move for him at that moment, as I believed in 2012, it is hard to tell, but the evidence now is that he came to believe late, but sincerely, that Go Dutch was a good policy. Fast forward to last Friday, and we had the second Times cycle hustings, this time badged as The future of London transport: a recognition (perhaps) of the way cycling has been moved, by campaigners and enlightened politicians, from a niche subject associated with sport and fitness to one that is regarded as having major economic and social significance in the likely future development of the city. At this hustings, we had none of the Boris-style rancour. In fact it was almost bland, with all the mayoral candidates (with the exception of the UKIP one) having signed-up to the LCC's demands this time round (due to another fantastic effort by campaigners, not just in LCC, but in Londoners on Bikes and Stop Killing Cyclists) and a general agreement that cycling has become mainstream transport policy, that future growth in the capital is anticipated and to be catered for, and that the infrastructure developments started under Johnson must be continued. This, at least, was the general rhetoric of the meeting. On the other hand, none of the candidates were themselves regular cyclists, with the exception of the Green candidate Sian Berry. Boris always had that going for him. He definitely knew what it was really like on the streets. There was a lack of real passion from the Labour and Conservative candidates, Sadiq Khan and Zac Goldsmith on the subject that may ring warning-bells. Formally they all seemed to be saying the right things: Khan talked about making London a by-word for cycling, 'On a par with Amsterdam, Copenhagen and Berlin'. (The inclusion of that last city will raise eyebrows for anyone who has a first-hand knowledge). Goldsmith promised to spend £100 million per year on cycling if elected. This would potentially keep the infrastructure building programme going at its current rate, though might not be enough to achieve LCC's demand of a tripling of the length of segregated Superhighways, plus a mini-Holland scheme in every borough that wanted it. Khan refused to be pinned down on money, while Berry promised 15% of the TfL budget, which would be almost four times as much as Goldsmith's commitment. Johnson's margin of victory in 2012 was only 62,000 votes. 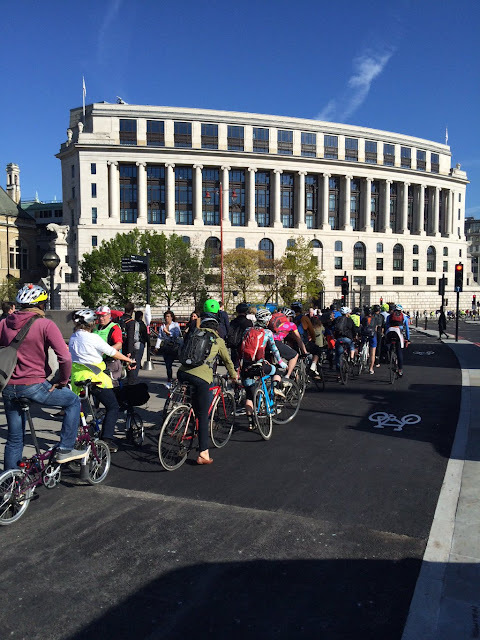 With the polls close again, and with certainly at least 100,000 regular cyclists in the capital, and enough others interested enough in the subject to be willing to vote primarily on the basis of this issue, or be strongly swayed by it, and with the level of organisation of the cycle lobby, it is clear that candidates now have to court it, as has been noted even on BBC news. Goldsmith should have been the easy winner of the cycle vote. He came with a track-record of supporting 'green' causes, unusually for a Conservative MP, and he was a one-time editor of The Ecologist magazine. And as a Conservative successor to Boris, sharing many similar views, he might have been expected to want to continue his legacy. But from the beginning of this campaign he has blundered and fumbled about this issue. At every opportunity he has seemed to want to talk up electric cars as being the future of personal transport in the city, almost as if he were in the pay of the manufacturers. He even suggested in an early interview that they might be allowed to use bus lanes, which would of course be disastrous for the many cyclists who still depend on bus lanes for some small measure of protection and priority where cycle lanes do not exist, should electric cars actually become popular. Later he became known for a quote in an LBC interview where he commented that if cycle highways did not work and were shown to increase pollution he would 'rip them up'. When this caused consternation, he claimed he was being 'hounded' by cycle campaigners. He tried to clarify and distance himself from these earlier comments in the hustings last week, claiming he had been misrepresented, and that he had only been stating a common sense position that if any piece of transport infrastructure were shown not to be working, one should consider removing it. But I think that emotive, unforgettable phrase, 'rip them up' is going to be inscribed on the tombstone of his campaign to become Mayor of London. Of course I'd agree that if a cycle facility isn't working, and isn't attracting cyclists, and isn't facilitating their progress in a safe manner, it should be removed. But, heres the point: it should then be replaced with a better facility. Goldsmith doesn't say this second part. He has never said that. He also seems to not understand that a piece of cycle infrastructure cannot 'cause pollution'. It is the motorists who are doing that. Goldsmith has repeatedly adopted the rhetoric of the 'bikelash' anti-cycle lane campaigners: the bizarre idea that cycling schemes force motorists to pollute. He may promise to spend money on cycling, but when it comes to all specific cycling issues, Goldsmith has been found wanting. He has repeatedly criticised the consultation process for the Superhighways and mini-Holland schemes, and repeated this criticism at the hustings. This criticism mirrors that of the 'bikelash' campaigners who want consultations re-run indefinitely to try to achieve a different result: consultations that typically have seen about two-thirds backing for the cycle schemes, after a huge response and a hugely expensive public engagement exercise. Goldsmith always comments that the Walthamstow and Enfield mini-Holland schemes have had poor consultation and been unpopular (not true), while, according to him, the scheme in his constituency, the Kingston mini-Holland, has been well-consulted and has been popular, and he states he 'hasn't received a single letter of protest about it'. 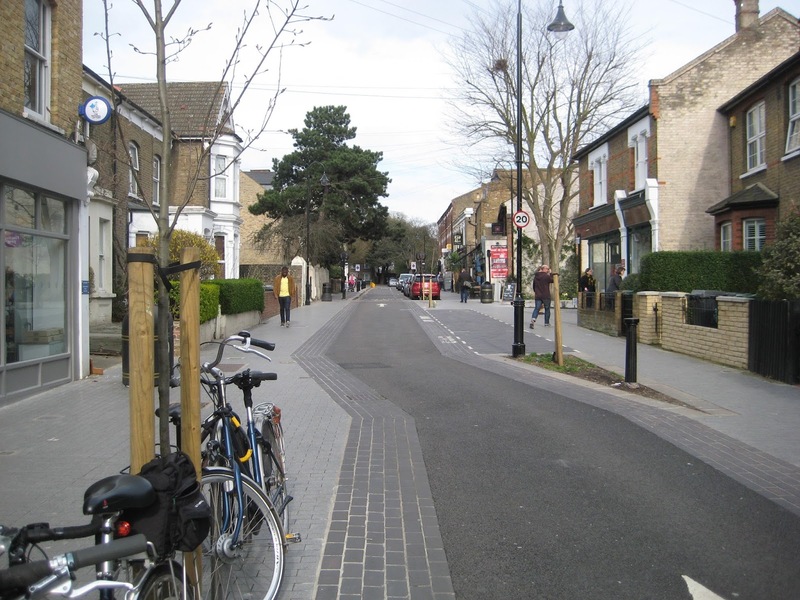 But he doesn't seem to have noticed that the other mini-Holland schemes are far more ambitious, particularly the Walthamstow one, which has achieved a far greater change in a short time. There is always going to be more resistance to more ambitious and more effective cycling and walking schemes. Goldsmith has shown he lacks the backbone to stand up to the short-term, short-sighted reactions of those who initially feel threatened. He has stated that he would waste TfL money and waste time by re-running the consultation on CS 11, decisively supported by a two-thirds majority. He has clearly allied himself with the opponents of effective cycling schemes. We've all noticed that. He was the last to sign up to Sign for Cycling of the major candidates. He waited for Khan to sign first. His attempt to re-establish his cycling credentials in an interview with the estimable Chris Boardman (that Boardman had to pretty much hound him to obtain) came too late. And still he comes out sounding wrong. In an interview for the Evening Standard today, Wednesday 4 May, headlined I'd be the greenest Mayor: pledege to clean up air with tax penalty on gas guzzlers, there's no mention of cycling in 25 paragraphs. With the East-West Superhighway likely to open tomorrow, election day, and under a headline on air pollution, he doesn't feel the need to mention cycling. He's not going to get many cyclists' votes. His Labour rival, Sadiq Khan, has wisely avoided commenting on specific current cycle schemes, by and large, apart from one odd interview in which the expressed an idea that some of the new cycle tracks were too wide: a comment greeted with incredulity in a city famous the world over for having ridiculously narrow cycle lanes and tracks. But he has repeatedly emphasised, and did so again in the hustings, the need for more segregated cycle tracks. Goldsmith has not done this, preferring to talk about Quietways (which have failed) and min-Hollands. Khan's manifesto commitments to cycling are more complete and convincing than Goldsmith's, despite his refusal to be specific on the money he would spend. Khan's comment that he would not yet be happy with his close family members cycling in London doesn't say to me he is talking down the potential of cycling, it says to me he understands the real safety issues that still prevent most Londoners who would benefit from cycling from using it as a daily means of transport. As the son of a bus driver, associated with the bus lobby, he doesn't seem the best politician to continue Boris's cycling legacy. Nevertheless, he seems a far better bet than Goldsmith. My own impression... was that Zac is nice but dim, but entirely lacking in stomach. At one point, he said that he didn't believe in "imposing grandiose schemes on local communities" - which is exactly what the Mayor is mandated and obliged to do. At least Boris wasn't afraid to appear unpopular in a meeting. He wasn't afraid of that at the 2012 cycle hustings, but we've also seen in a video of a TfL board meeting how he personally pushed the E-W Superhighway project along against prevarication from other Board members. Would Goldsmith do this? It looks very unlikely. London is at a crossroads, and it looks like a Mayor Goldsmith would turn in a different direction. The London 'cycling revolution' would be in severe danger with Goldsmith in charge. The London Green Party has consistently been the most in touch with cycling issues over the past four years, with Green Assembly Members Jenny Jones and Darren Johnson consistently asking pertinent questions of the Mayor, compiling relevant papers and reports, and actually getting out on bikes on the roads in all parts of London to find out what cycling conditions are actually like there: not just in Westminster and the City, but in remote car-dominated suburbs too. I showed Jenny Jones round the appalling Neasden gyratory system on one occasion (which she said was the most depressing experience she had had on her cycling survey of London), and this (and this blog) influenced a valuable report on cycling in Outer London produced by the London Greens. 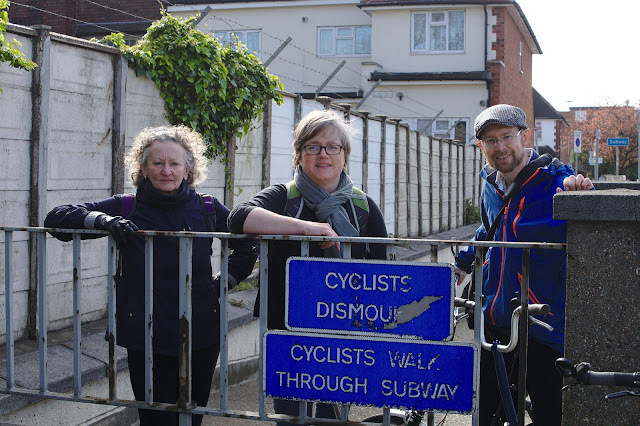 Very recently I showed Green Assembly candidate Caroline Russell around the Brent Cross area and the A41 Hendon Way, where TfL seem to have abandoned plans for an outer section to CS 11, but where safe space for cycling is desperately needed. 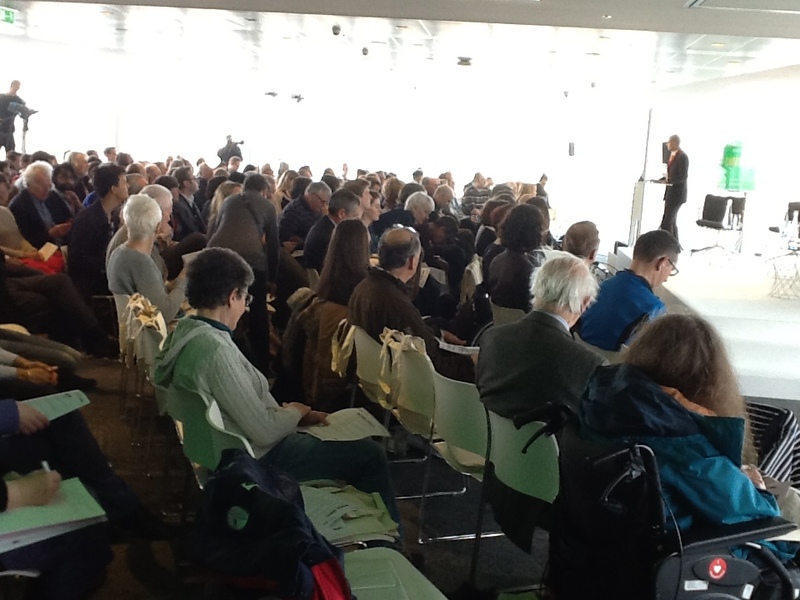 The Greens have been engaged in the issue beyond other parties, pushing Boris every step of the way, though there has also been sterling work by Caroline Pidgeon, Liberal Democrat Assembly Member and mayoral candidate. I'm therefore going to be voting for Sian Berry for Mayor as my first preference. I'd like to vote for Pidgeon as well, but the system means that the second preference vote must go to the candidate who can stop the worst candidate, who is Goldsmith. So my second preference vote will be for Sadiq Khan. I recommend all those who give their first preference vote to Berry or Pidgeon to give second preference to Khan. In the vote for London-wide assembly members, I recommend a vote for 'Green' for the reasons given above. The two Green Assembly members (who are both retiring) have been critical to ensuring London has progressed this far in creating a cycleable and walkable city, and their successors I am certain, from personal discussion, will carry on that work. The more of them that are elected under the proportional London-wide ballot the better. The vote for Constituency Assembly members is a 'first past the post' system. For those in my constituency, Brent and Harrow, I recommend a vote for the sitting Labour Assembly Member, Navin Shah. He has also worked hard on behalf of walking and cycling, persistently asking the mayor awkward questions, particularly about Barnet's proposed ugly, car-centric Brent Cross Cricklewood development. At a recent meeting in which I personally questioned him, he affirmed his support for more segregated Superhighways and a mini-Holland in every borough, and said he believed CS 11 should go ahead as planned. For those in the Barnet and Camden constituency, I recommend a vote for Andrew Dismore, again the sitting Labour Assembly member, as he has also been helpful. Things have moved on so far from when I first started campaigning, decades ago, when cycle schemes were so insignificant and below the public radar as never to be discussed even by senior councillors, and were hardly known to anyone except some sad campaigners and equally sad junior council officers, who were never promoted. We're in a different world today, with national-level politicians forced to answer on exactly what they will do for those wanting to travel on two wheels, and knowing that their answers will matter for their future. London is at a crossroads on its journey to become a people-friendly city. The opening of the Superhighway within hours of election day will be apt and rather symbolic. If you have votes in this election, please use them carefully to ensure that journey continues.